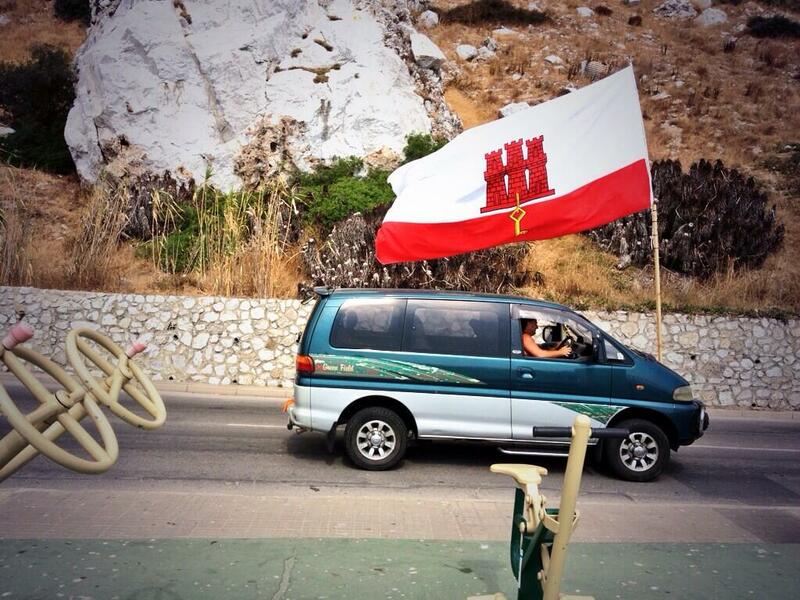 Until the ‘Gibraltar situation’ is resolved we will compile daily updates in this live blog. Follow @RGPolice for the latest on queues leaving Gibraltar. For incoming queues phone 20042777. The live blog is finished but we continue to keep an eye on the frontier queues, and post regular round ups on a our daily general blog. 18:00 – by late afternoon queues into Spain had reached two hours but suddenly vanished. There are currently no queues at all. 13:00 – Chief Minister Fabian Picardo’s meeting with Prime Minister David Cameron has been postponed to tomorrow because of the House of Commons debate on Syria. Accompanying Picardo on his trip to London is also Gibraltar Gaming minister Albert Isola who meets HM Treasury officials this afternoon. 12:30 – within the last hour, queues out of Gibraltar have started to build. overnight – Gibraltar police are investigating an incident in which ‘a small number’ of ‘missiles’ were thrown at Spanish police from across the border, apparently from the motorcycle holding area. They are appealing for witnesses. 19:30 – the queue situation has not improved since 16:00. 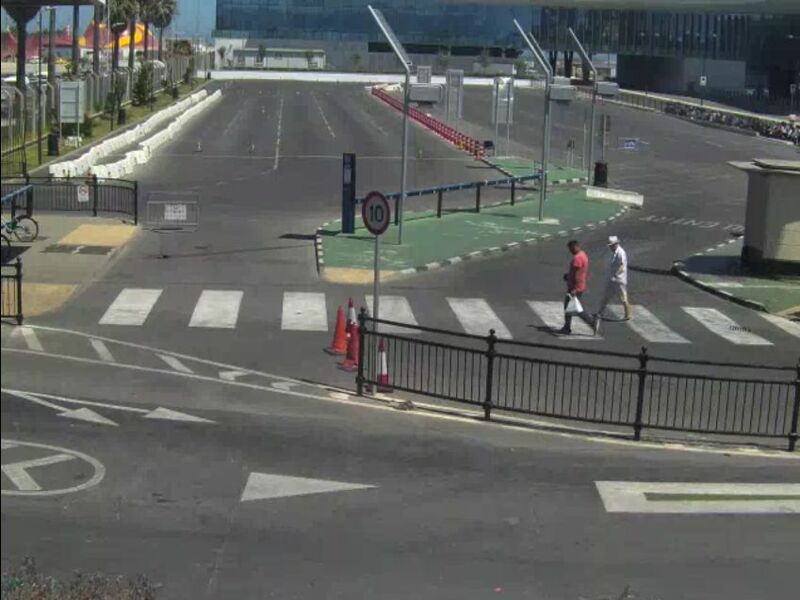 12:00 – no queues on the Gibraltar side currently. Oh dear. The mayor of ccc caused a stir by putting this picture on his Facebook page. 20:00 – very quiet day at the frontier. roundup – UK Foreign Secretary William Hague told reporters at today’s emergency UN meeting on Egypt that, ‘no-one should underestimate the British government’s determination to stand with the people of Gibraltar.’ Talking after that meeting Spanish Foreign minister Garcia-Margallo said the British government had agreed to bilateral talks on the Gibraltar issue in April 2012 and should honour that commitment though the other side disputes this version of events says GBC News. 12:40 – no reports of border queues either side so far today. 11:00 – hard to discern the ins and outs of this one but basically the Spanish government is blocking delivery of sand to Gibraltar after protests from an environmental group over from where a previous quantity of sand was obtained..
overnight – our first Gibraltar joke! @JamesNeish tweets: ‘Guardia at frontier says my passport pic look nothing like me. I politely replied it did when I joined the queue.’ Ta-da. We should really have seen that one coming. The flag of Gibraltar. Photo via @JamesNeish. 19:00 – queues at the Gibraltar side of the frontier built up this afternoon. @RGPolice tweeted at 17:30 that Guardia Civil were carrying out ‘stringent checks’. By 18:30 the queue was three hours and does not look to have subsided any since. 18:30 – the Daily Telegraph’s Madrid correspondent Fiona Govan says the border levy has been reconfigured as a congestion charge, as expected. ‘A possible tax on traffic passing through the congested area of La Linea would certainly conform to EU norms,’ she quotes a source at the Spanish Foreign Office saying. 12:30 – according to Reuters, the UK says it will not negotiate with Spain over the sovereignty of Gibraltar but ‘could envisage’ a discussion over fishing practices (though not control of fishing waters). 11:00 – Spanish foreign minister Garcia-Margallo sets out the situation from Spain’s point of view in a piece in the Wall Street Journal. There’s a whole list of complaints, from the UK apparently not observing a 1968 UN resolution to smuggling, tax evasion, and the environment. The upshot is that Spain will not discuss the matter with the UK unless the concrete blocks are removed. 09:30 – from www.frontierqueue.gi, no queues into Spain this morning. overnight – more detail on the border crossing fee Spain wants to levy. To be double clear, it wasn’t discussed between Rajoy and Barroso on the phone. All comments come from Barroso’s spokesman in a press conference afterwards. The Commission says a flat fee for crossing would be illegal. Spain is reportedly considering a congestion fee, as in London, according to @DenisMacShane, who also adds, ‘It used to be iron rule not to allow Brussels to arbitrate between London and Madrid on Gibraltar. Cam seems to have sold that pass.’ Former MOD advisor @LukeDCoffey points out, ‘Have you noticed that EU statements refer to the dispute being between UK & Spain. No mention of Gib.’ Finally, Spanish public services trade union ‘Manos Limpias’ has filed an official complaint with the EU about the concrete artificial reef. 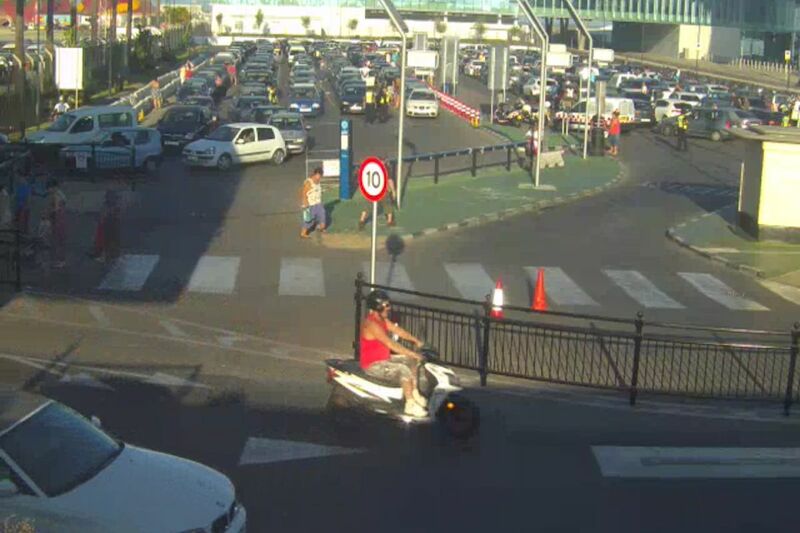 17:30 – traffic is flowing freely, at least on the Gibraltar side. 16:30 – Google translating the statement released by the Spanish PM’s office following the conversation with Barroso is very risky. But. It seems to suggest three things: that the conversation was at the request of Barroso; at no time did they discuss a congestion tax (the €50 fee for crossing the border); and that Rajoy asked the Commission to make sure Gibraltar is not breaking European law on money laundering, smuggling and taxation. 15:30 – a very to-the-point statement from the European Commission says, in its entirety: ‘President José Manuel Durão Barroso and the President of the Spanish Government Mariano Rajoy spoke on the telephone today on the Gibraltar issue. They agreed that a Commission fact finding mission should as soon as possible examine in loco the border control / movement of people and goods questions. President Barroso expressed his hope that Spain and the UK will address these matters in a way that is in line with their common membership in the EU.’ As we understand it, the delay in sending a monitoring team was because the Commission needed this permission from Spain. 14:00 – according to @GBCNews, Spanish fishermen have threatened further protests. 13:30 – a fee to cross the border would be illegal Barroso tells Rajoy in their conversation this lunchtime, see below, according to the Telegraph’s new Live Gibraltar Blog via Europa Press following a press conf. with Barroso’s spokesman Olivier Bailly. The mood seems to be that the European Commission wants to keep out of it, or at best play a minor mediation role. Not sure if any UK or English speaking journos were at the PC. 09:00 – HMS Westminster, the 4,000t Type 23 frigate, part of the Response Force Task Group Condor 13 British naval exercise, has arrived at Gibraltar Port. Westminster is accompanied by Mounts Bay and Lyme Bay auxiliary ships. The BBC reporter covering the story says checks crossing the border last night were ‘meticulous’. There had been no significant queues during the day yesterday. 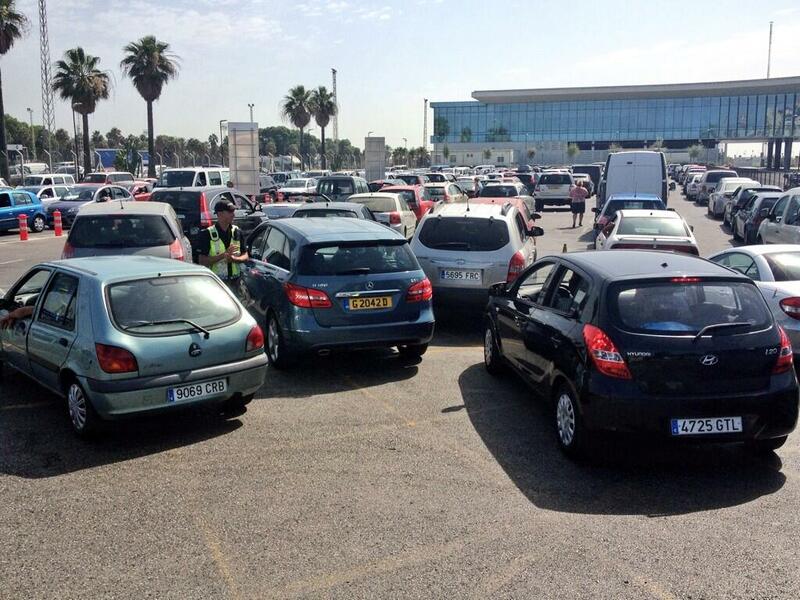 @RGPolice say there are no queues exiting Gibraltar this morning. Overnight – it turns out there was contact between vessels during yesterday’s fishing boat protest. @JamesNeish tweets, ‘Just seen footage of a RIB accidentally hitting another during this morning’s protest. The sea can be dangerous. @David_Cameron solution?’ A RIB is a ‘rigid-hulled inflatable boat’ used by police, etc. No contact was made, and nobody got hurt, but it was touch and go for a while as over thirty Spanish fishing boats, escorted by Guardia Civil vessels, faced off with their Gibraltarian counterparts this morning. 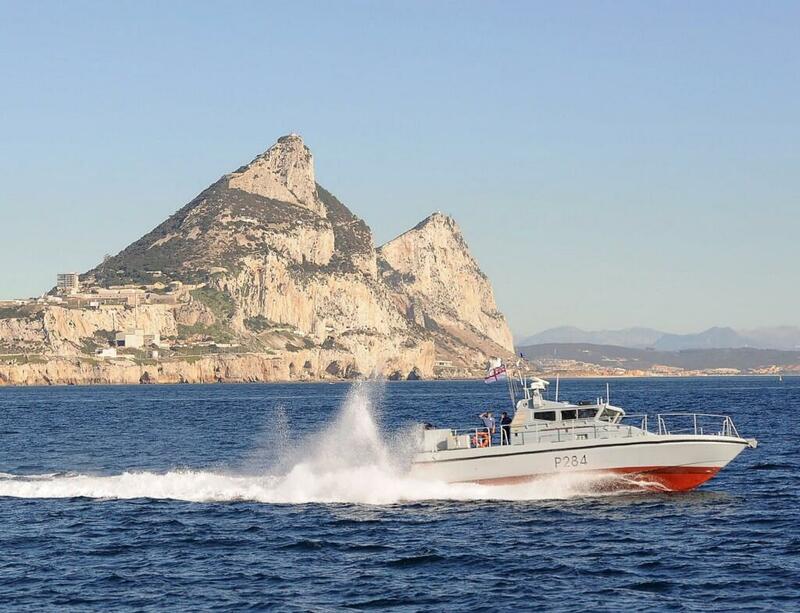 Accompanied by flag waving and horn honking from the crowds assembled on the shore, Gibraltar police boats performed ‘some strong manoeuvres’ to head the Spanish boats off. They were protesting about the artificial concrete reef though they abandoned earlier plans to start trying to remove it. ‘What happens next in this on going row is far from clear,’ says GBC News. The three Royal Navy ships from the Response Force Task Group are due in Gibraltar Port tomorrow. Otherwise it has been a quiet day at the frontier. Photo via @GBCNews. 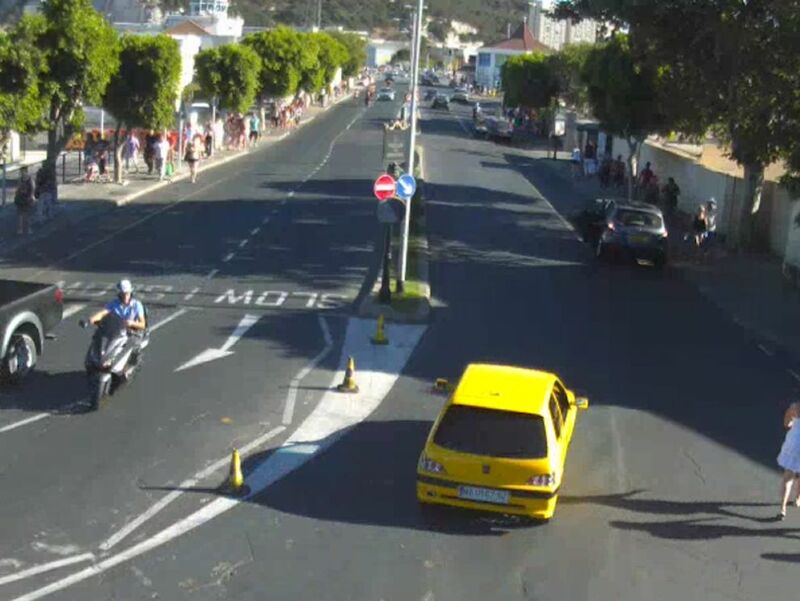 17:00 – traffic flowing freely on Gibraltar side. 13:30 – queue watch. There’s no delay out of Gibraltar at present. 12:00 – @Steven_Woolfe, UKIP Financial services spokesman tweets: ‘The #EU have announced in advance what date they’ll be monitoring #Gibraltar border. Doubt they’ll be queues that day.’ He includes a link to yesterday’s BBC story on Cameron calling on Barroso to intervene, but there is no date mentioned. 09:00 – queue watch. 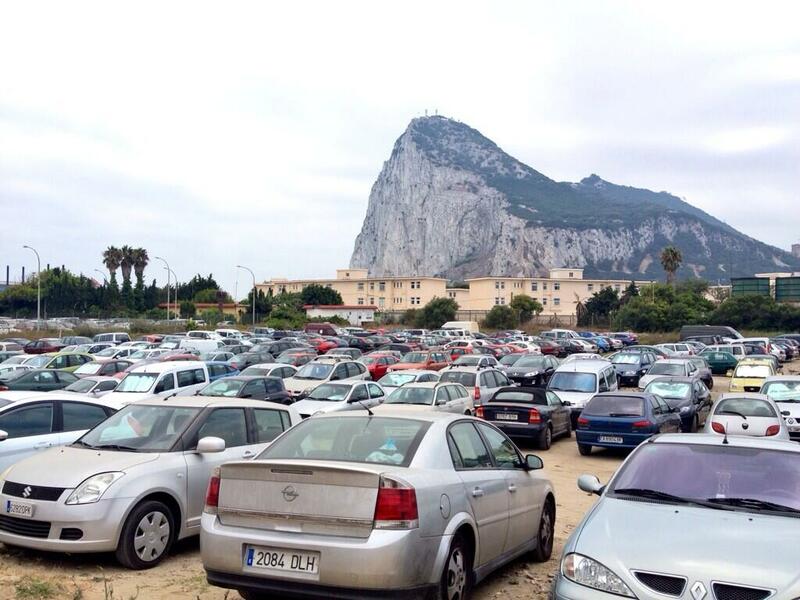 @RGPolice: ‘#GibFrontier 5 lanes already implemented. Tailend at the top of the loop. EQT: 20 mins.’ The www.frontierqueue.gi webcam on the frontier view is not loading currently. note: re the Royal Navy’s Response Force Task Group. Important to bear in mind as it nears the region, one of the ships will be calling in at the Spanish naval base at Rota in the Gulf of Cadiz, on the other side of the Strait of Gibraltar. overnight – local TV news anchor Stephen Neish, @GibSteve, tweets: ‘Spanish fishermen starting to backtrack: latest reports are that they’re talking about removing “some” of the blocks as it’s “complicated”.’ Referring to apparent plans by Spanish locals to start removing the concrete artificial reef in the bay of their own accord tomorrow morning. Disturbing development, albeit unconfirmed, following yesterday’s suspected arson on a Gibraltar registered car in Spain. @Ruffo0405 tweets last night: ‘3rd Gibraltar car burnt in 48 hours in Spain. Our CM and family received death threats.’ The latter refers to twitter troll death threats apparently received by Chief Minister Fabian Picardo. Conservative MEP for Gibraltar Julie Girling says she has also been targeted. 16:35 – @SkyNewsBreak tweets: ‘PM speaks to European Commission Pres Jose Manuel Barroso who says it would not hesitate to uphold EU laws in relation to Gibraltar dispute.’ The BBC says Cameron asked Barroso to send a team to monitor the border situation ‘urgently’. 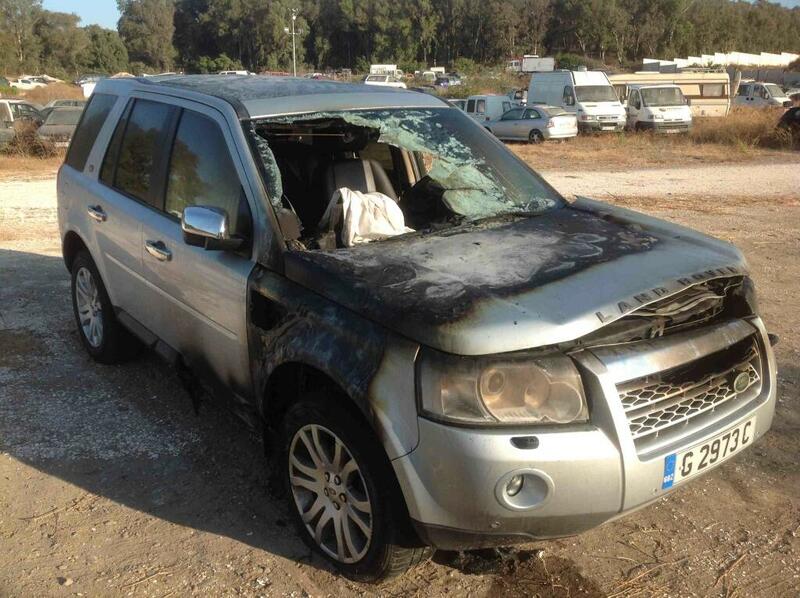 A burned out Gibraltar-registered Land Rover Freelander was found burned out just over the Spanish border late last night. The owners had parked it up there to avoid lengthy border queues. Police have called for calm: ‘Certain rumours are being posted on social media regarding the Gibraltar registered car that was on fire in Spain. We are liaising with the Polícia Nacional on this & urge people not to enter into unfounded speculation which only creates unnecessary anxiety.’ Photo via @GBCNews. 10:00 – Spanish fishermen are reportedly intending to remove the controversial concrete blocks themselves on Sunday morning. 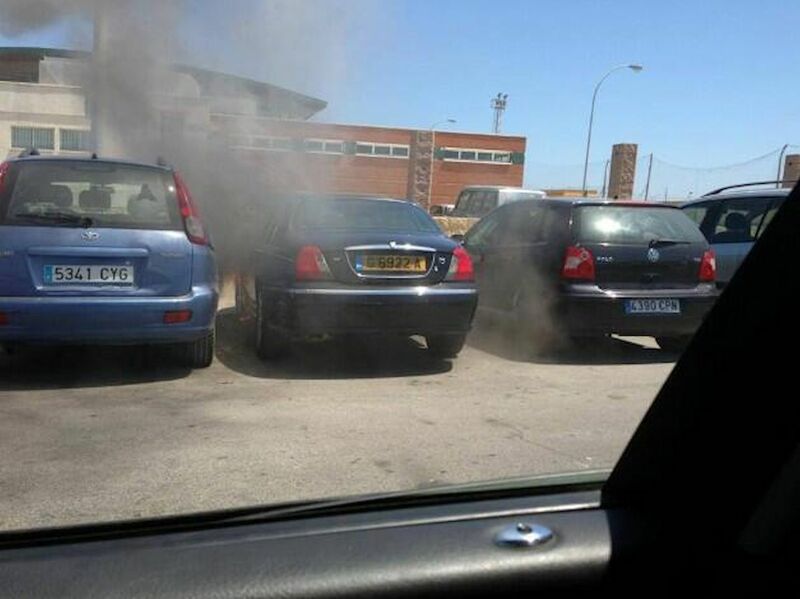 Also, a Gibraltarian car was apparently set on fire in La Linea, the town across the border. 09:00 – @JamesNeish tweets: ‘As a journalists we can be surprised by the news agenda. Is it becoming predictable? A good story to report would be no queues on a Friday!’ Traffic flowing freely in both directions so far. No news yet on when the Royal Navy ships are due to arrive; we predict the situation will become much more unpredictable from then. Queue watch: after a quiet day yesterday, border delays crept up to four hours by lunchtime. As at 19:00BST, motorbikes were waiting 30mins, and cars three hours according to @RGPolice. 17:00 – Gibraltar PM Fabian Picardo tells Reuters he thinks the territory would win any legal case against the Spanish government over fishing rights and border controls ‘game, set and match’. But he adds, ‘I’m putting on the table now the possibility of discussing with Spain a double taxation or tax information agreement.’ Is this a sign of movement or compromise from Gibraltar? 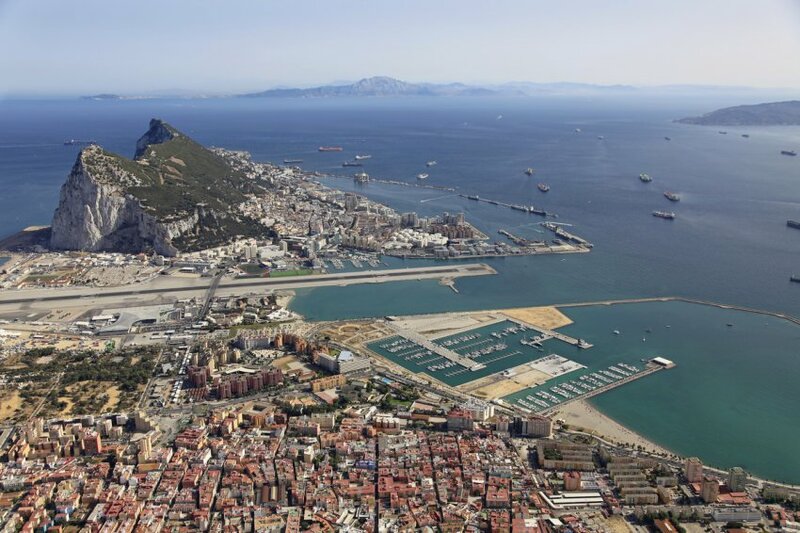 Roundup – Spanish enclave Ceuta in Morocco hopes any moves to restrict Gibraltar’s ship refuelling ‘bunkering’ business will not adversely affect its own burgeoning business in the sector. More Guardia Civil officers have been drafted to the border. Spain has reportedly used ‘firm and tough language’ in its official rejection of British complaints over the border checks saying tobacco smuggling increased 213% from 2010-12. It also says the frontier controls are not a hindrance to free movement. 10:00 – queue watch. Traffic has been flowing freely Gibraltar-Spain but queues have been building up in the other direction: currently two hours. 19:00 – traffic still flowing smoothly. 14:00 – the BBC interviews Ignacio Ibanez, Spanish director for foreign affairs, who says. ‘We are ready to discuss but to discuss we need an environment where you trust each other and, with what happened over the fisheries [artificial reef in the Bay of Gibraltar], it is difficult to trust the UK.’ Ouch. He also referred to the Falkland Islands as the Malvinas. 13:45 – traffic across the border is flowing freely and has been all day so far. 11:00 – the separatist Esquerra Republicana de Catalunya (ERC) party, the largest party in the region, has sent a letter of support to Gibraltar PM Fabian Picardo. ‘Your liberty is our liberty,’ said the letter from leader Alfred Bosch. Catalunya, in the north east of Spain, capital Barcelona, has long-held ambitions to break away from the rest of the country. 07:10 – for clarity, the three ships from the Response Force Task Group calling in at Gibraltar – at a time as yet unknown but within five days now – are: HMS Westminster (frigate) and RFA Mounts Bay & RFA Lyme Bay (both Amphibious Support Platforms). 07:00 – queue watch. Traffic seems to be flowing in both directions. After yesterday, one wonders how long this will continue..
19:00 Queue watch: a strange day. Traffic leaving Gibraltar flowed smoothly for most of the day while cars queued for up to five hours by lunchtime coming the other way, see photo below. By evening though drivers were waiting up to three hours to leave. The holding area on the Spanish side of the border this lunchtime. Photo via @GBCNewsroom. 15:00 – former Defence chief Pedro Pitarch says ‘Spain is dropping pants to the UK’ and should make a military gesture in response to the three-strong British naval force due to arrive within the week. 13:00 – @GBCNewsroom: ‘Fisheries minister Sr Cañete to make bunkering laws stricter in waters off Europa Point controversially declared a Spanish SCI by EU.’ Bunkering is ships’ refuelling. See the full story. Overnight – mischievous and legally dubious proposal from well-connected Brussels blogger Jon Worth: Gibraltar should join the Schengen Zone, i.e. do away with the border completely as between other EU countries. 17:00 – A ‘Your Gibraltar TV’ report – retweeted by a member of the European Commission – says a team will be sent down to inspect the border within two weeks, much faster than originally thought. 15:00 – AGI press agency reports the Spanish Foreign Ministry saying it will not scale down the recently introduced extra border checks between Spain and Gibraltar. 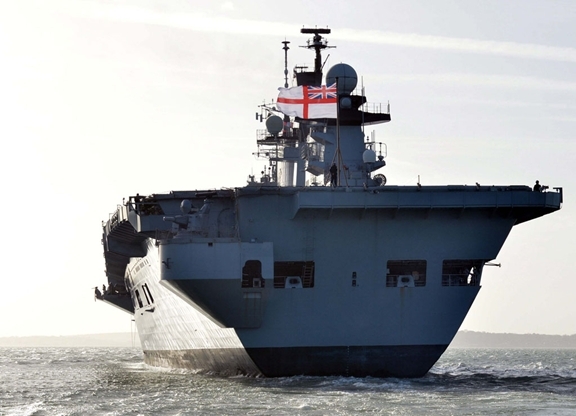 12:00 – Sky News reports the British govt is considering legal action against Spain over the extra checks as helicopter carrier HMS Illustrious leaves Portsmouth for Gibraltar, first stop on the Response Force Task Force Cougar ’13 exercises. 15:25 – a thought. From the ameliorating noises on the phone to David Cameron last Wednesday, to the call for four-way talks over Gibraltar the other day, PM Rajoy seems to be playing quite soft. Meanwhile, foreign minister Garcia-Margallo was the one who called for blocking airspace and the €50 levy (and who has never met a British person without asking for Gibraltar back says @DenisMacShane). The question is, is this just Mister Nice-Mr Nasty, or – in his weakened state – is Rajoy just not able to control his hawkish foreign minister? Would say the former for the time being but will be watching for signs of the latter keenly from now on. 14:20 – all quiet on the Gibraltar front currently, no queues. 10:25 – Google translating Spanish press seems to suggest the €50 congestion fee at the Gibraltar border will be levied on tourists only. Judging by a piece in yesterday’s chronicle.gi, that would appear to be correct. overnight – from local journalist @JamesNeish, ‘Spanish Foreign Minister tells TVE he will press ahead with frontier toll,’ and ‘Margallo dismisses tripartite talks. He will only accept talks as 2 flags (UK & Spain) or 4 to put Gib on par with Junta Andalucia.’ This last point accords with what PM Rajoy said yesterday, via @DenisMacShane. Not sure yet how the Gibraltarians feel about sharing talks with Andalucian local authorities. 14:00 – no queue on the Gibraltar side. Because a Spanish TV crew turned up? update: AFP further quotes Rajoy saying, ‘We will take legal measures which are proportionate to defend the interests of Spaniards.’ The comments were made following a meeting with Spain’s King Juan Carlos. 11:00 – AFP quotes Jose Luis Ayllon, the Spanish secretary of state for parliamentary relations: ‘We will never scale back on our responsibility to defend the security and interests of the Spanish people,’ adding, ‘Our willingness for dialogue with all friendly countries obviously remains intact.’ Does the UK come under the title of ‘friendly country’? 09:00 – @LukeDCoffey, Margaret Thatcher Fellow at the @Heritage Foundation – ‘devoted to the principles of free enterprise, limited government, individual freedom, traditional American values, and a strong national defence’ – and former special advisor at the UK MoD, points out: ‘Funny coincidence that the day RN visit Gibraltar is announced is also the 425th anniversary of the defeat of the Spanish Armada 8-AUG-1588.’ We checked; he’s right. note: we can’t find this story on the paper’s website (update: we can now). Currently 32 other major news sources for this story. 00:10 – former Gibraltar politician @FabianVinet tweets: ‘Can’t help feeling Mr Rajoy’s now wishing he’d thought of a better smokescreen to divert attention. 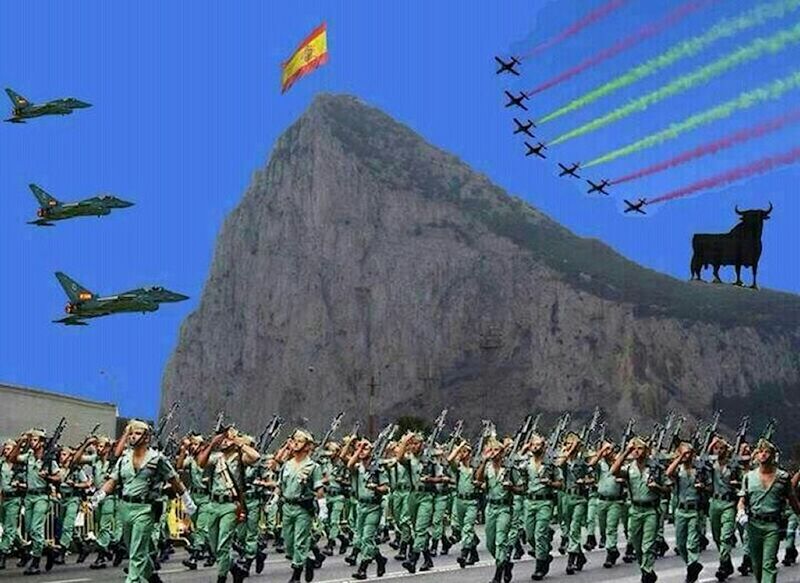 The Gibraltar ‘conflict’ has backfired.’ Is this a bit presumptuous? Perhaps we’ll find out today. 14:00 – all very quiet today newswise. As of this lunchtime there were no border queues on the Gibraltar side. 16:00 – the Royal Navy is sending nine ships to Gibraltar, including HMS Illustrious aircraft carrier and three frigates. They will arrive on Monday. The Daily Telegraph who broke the story quotes an MOD spokesman calling the trip ‘long planned and well established’. It’s apparently part of a four month deployment that also includes exercises in the Med. and off the coast of Africa. Phew! 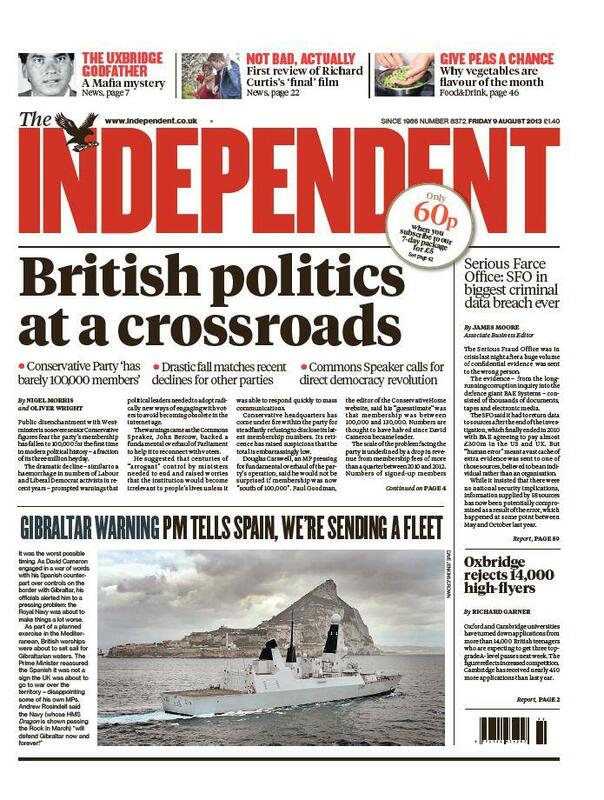 Funny that nobody mentioned it the other day when Picardo was calling for a frigate to be sent down. Perhaps he didn’t know about it, or had forgotten. Gibraltar: http://www.frontierqueue.gi webcam looking down Winston Churchill Avenue, the approach road to the border, at 18:00BST, 7 August. Late news: Hague and Garcia-Margallo have spoken (this afternoon). Unless it’s very cleverly worded, can’t see any news – tho Hague did make the point that Gibraltar chief minister Fabien Picardo was within his rights to revoke the agreement that allowed Spanish fishermen to work in Gibraltar waters (see Telegraph article below). The BBC’s Gavin Hewitt says there is no mention of concessions at the border in a statement released by the Spanish Government. Number 10 statement released. Says next step is discussion between UK and Spain foreign ministers, Hague and Garcia-Margallo. No mention of when that is likely to happen. ‘No.10 says Spanish PM told David Cameron he is “committed to reducing measures at the border” of Gibraltar. Quick win for Cam,’ reports @PaulWaugh, editor at www.politicshome.com. The Royal Navy warned a Guardia Civil vessel sailing very close to a tanker moored off the Gibraltar coast this morning. A Royal Navy vessel off ‘The Rock’ this week, photo via @JamesNeish (originally @GeorgeBlakeman). Peter Hain, former Europe minister under Tony Blair’s government, who negotiated an agreement over Gibraltar in 2002 – subsequently abandoned – ruffles feathers by calling for shared sovereignty in an interview on the BBC Radio 4 Today programme. 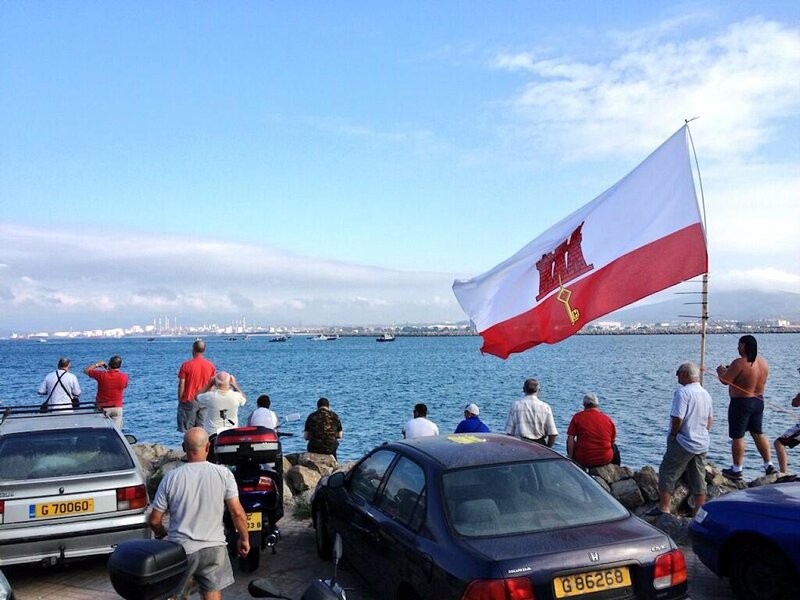 The La Linea Gibraltar Working Group – a forum in the town across the border made up of local reps, including fishermen – has called on the Spanish govt to stop its action at the border, but also the Gibraltar authorities to remove the concrete blocks in the bay which sparked the latest confrontation. Argentina has renewed its claim to the Falkland Islands at a United Nations Security Council meeting. In an interview with Spanish daily ABC, Foreign minister Jose Manuel Garcia Margallo says ‘playtime is over’. The Spanish government is considering a €50 levy for entering and leaving the territory, as well as other isolating measures. It’s hard to see how the two sides can step back from this. Read gbc.gi’s summation of the situation here. Police warn against taking cars into Spain today ‘unless necessary’. Queues reached three hours at one point as border guards again started to search every vehicle. By this afternoon though queues had subsided. The tension continues to ratchet up in the territory after Spanish fisherman threaten a blockade over the laying of an artificial reef in the bay. The FCO carpeted the Spanish ambassador on Friday over the continuing harassment at the border. In the meantime, should you avoid Gibraltar, or make a beeline for it? Every one of the 10,000 cars passing over the border from Gibraltar to Spain were carefully checked by border guards yesterday. Motorists waited for up to eight hours in sweltering heat. There were also large queues on Friday. Local broadcaster GBC News calls it ‘an undeniable retaliation tactic from the Spanish authorities following last Thursday’s incident at sea’ when Royal Navy ships attempting to lay an artificial reef in the bay were disrupted by Spanish fishermen. This is latest in a string of confrontations after mediation between Spain and the UK over the territory broke down last year. Such incidents are often followed by hyper-vigilance by Guardia Civil officers at the border. 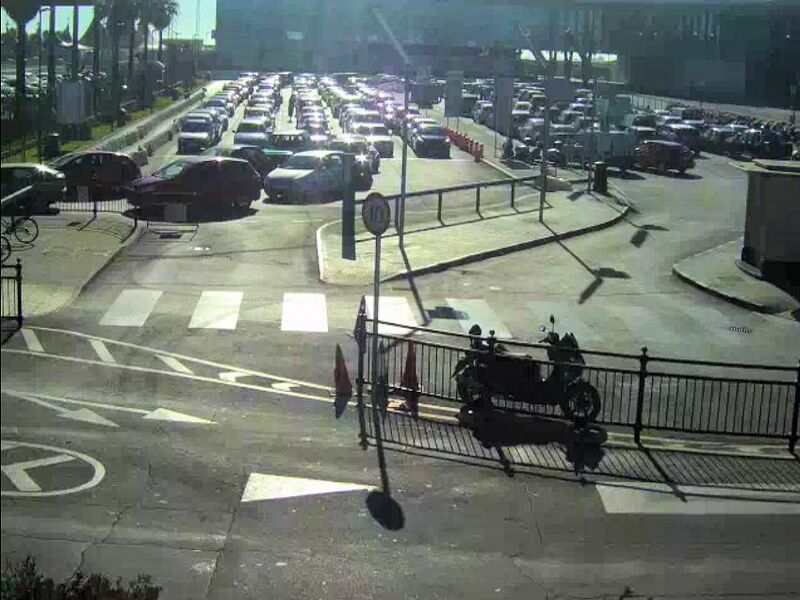 At the time of writing, there were no queues out of Gibraltar, but drivers coming in are waiting up to two and a half hours according to GBC News. Spain will never change. They should be carefull lest Catalunya and Euskadi do a final bunk. Truly who wants to be part of this sorry country.